Over 50 concerts—by full orchestra, chamber groups, and soloists in recital— take place during the Tanglewood summer season, including the famous weekend Boston Symphony Orchestra	concerts. The number-one summer activity in Lenox MA is, of course, the Tanglewood Music Festival, which takes place on the Tanglewood Estate, the summer home of the Boston Symphony Orchestra (BSO), 1.5 miles (2.4 km) west of Lenox along West Street (MA Route 183; map). Since 1934 the concerts have been held in July and August on the grounds of Tanglewood, a fine estate about a mile west of the center of Lenox out in the Berkshire Hills. The main concert venue is the amusingly-named Koussevitsky Music Shed, a simple but spacious hall capable of holding an entire Mahler-sized symphony orchestra and 5,700 concert-goers—some "shed!" Many chamber music and ensemble performances and solo recitals are held in the award-winning Seiji Ozawa Hall on the Tanglewood campus. In addition to the seasoned musicians from the BSO, there are performances by the young and extremely promising musicians who attend the Tanglewood Music Center for study and advanced training. Maestros Seiji Ozawa, former music director of the BSO, and the late Leonard Bernstein of the New York Philharmonic, were once among this young up-and-coming elite. 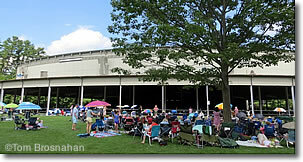 Special excursions to Tanglewood concerts are offered by various tour companies, making it easy to attend even from Boston, New York, or other regional cities, even if you don't have a car. If you drive to Tanglewood, expect heavy highway traffic on the Mass Pike (Massachusetts turnpike, I-90). Don't expect to be able to go full-speed all the way to Exit 2, the Lee exit. Also, expect a tremendous jam of traffic after the concert. The flood is ably directed by Tanglewood staff, but the exodus over narrow country roads and town streets takes time nonetheless. You may just want to continue your picnic or wander the grassy grounds for awhile until the roads clear. Here's transportation information for the Berkshires. 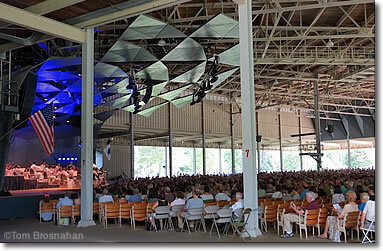 The massive Koussevitsky Music Shed at Tanglewood, with seating for 5,700 inside, and thousands more on the Lawn.